'Wise' (Thomas Johnson, R. 2000). Seedling #Q61B. MDB, 7" (18 cm). Early bloom and rebloom. 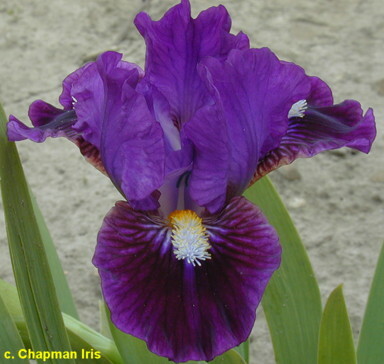 Standards and style arms dark purple; falls darker purple, dark purple band; beards white, gold in throat, wide and bushy; ruffled; pronounced sweet fragrance. 'Bee Mused' X 'Tweety Bird'. Mid-America 2001. Honorable Mention 2003; Award of Merit 2005; Caparne-Welch Medal 2007.